Thyroid disorders are among the most frequent diseases in the world, with about 1.6 billion people at risk and women four to seven times more likely to be affected. Up to 50% of those affected are thought to be unaware. 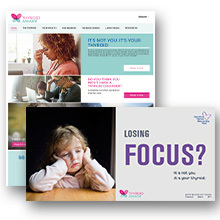 Merck challenged Porter Novelli to help raise awareness of thyroid disorders in women to encourage testing among those displaying symptoms, while positioning Merck as a leader in the field of thyroid disorders.